As I work to soak up every last bit of warmth Mother Nature has to offer, I continue to entertain on our deck. Last week offered a seesaw of daytime highs, and this 74 degree afternoon seemed perfect for a cup of warm mulled cider in place of tea to go with our (bakery) apple strudel and very lively conversation. 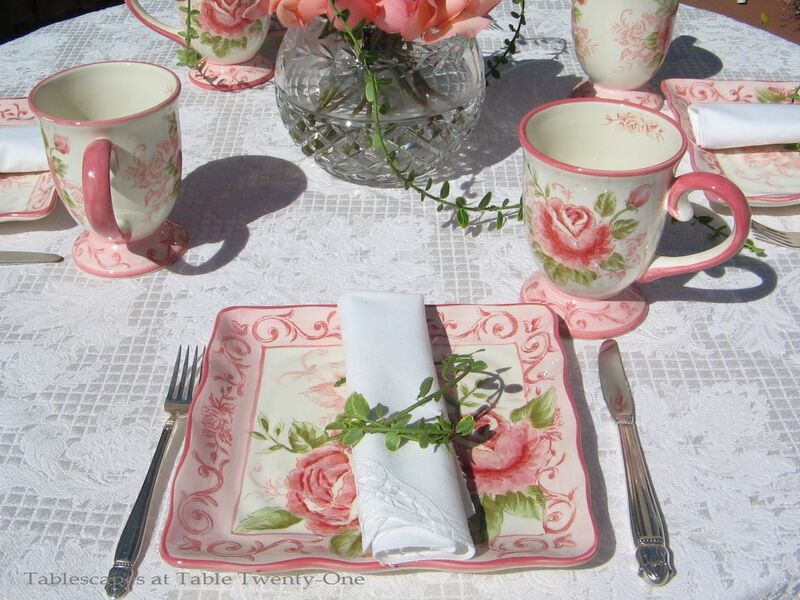 If I could dress every tea time table in pink and white, I would! There is nothing so feminine as the soft color of pink!!! I just love little touches like this! 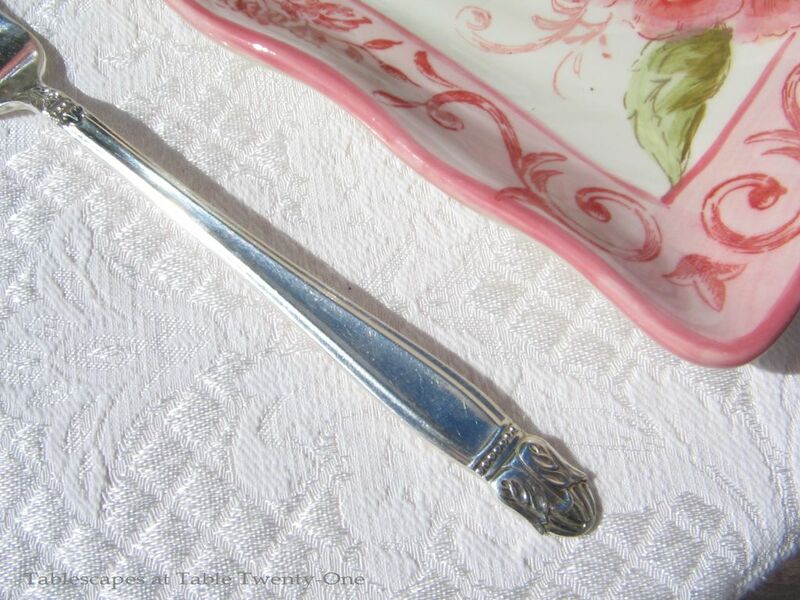 This “Danish Princess” silverplate design is among my favorites and such a great match for the very feminine dishware. Each delicate cotton luncheon napkin was rolled and “tied” with a garland of euonymus from the yard. The gorgeous pink roses were sent earlier in the week from former clients commemorating their six-year anniversary. (It’s so nice to be remembered. I was truly touched by the gesture!) I’m very glad to have had the opportunity to share their beauty and wonderful fragrance with friends. 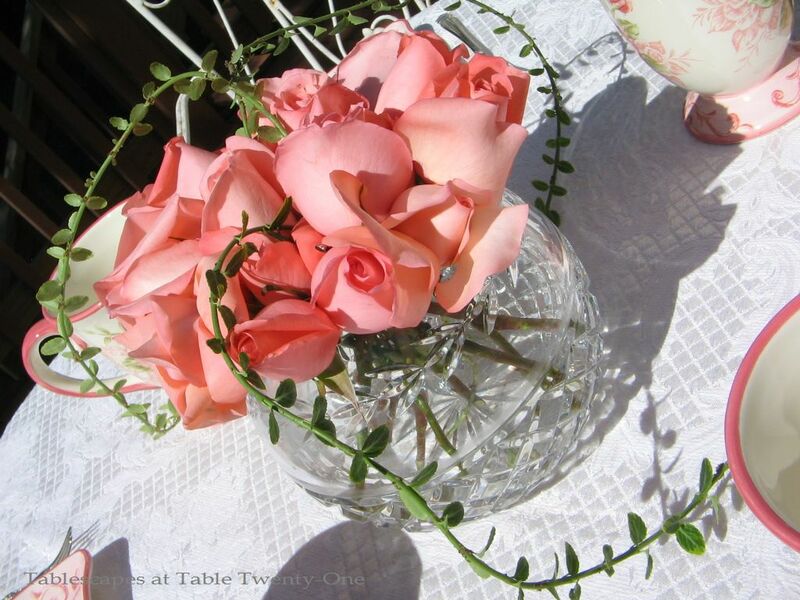 The roses are displayed in a Godinger crystal rose bowl with the classic “Olympia” design. 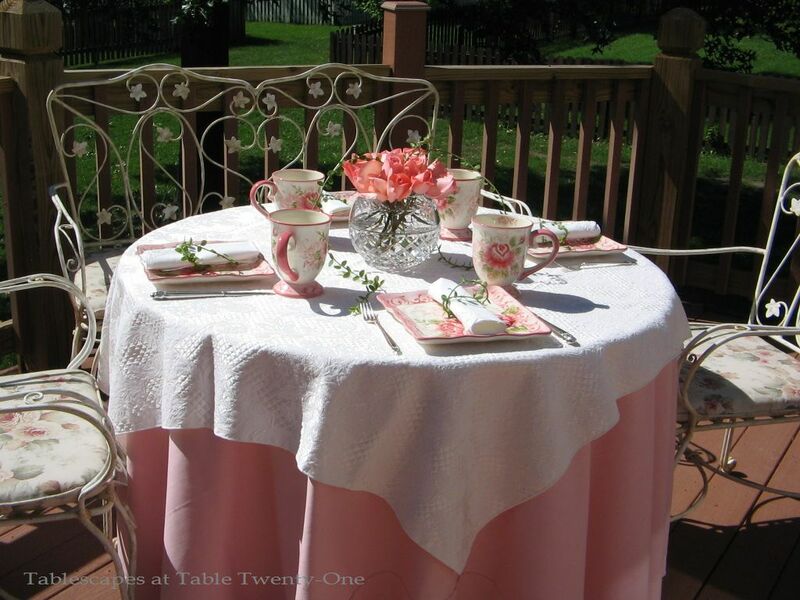 Even though apple cider was on the menu this past week, I am so happy to once again join in with the discerning women at Lady Katherine’s Tea Parlor for Tea Time Tuesday! 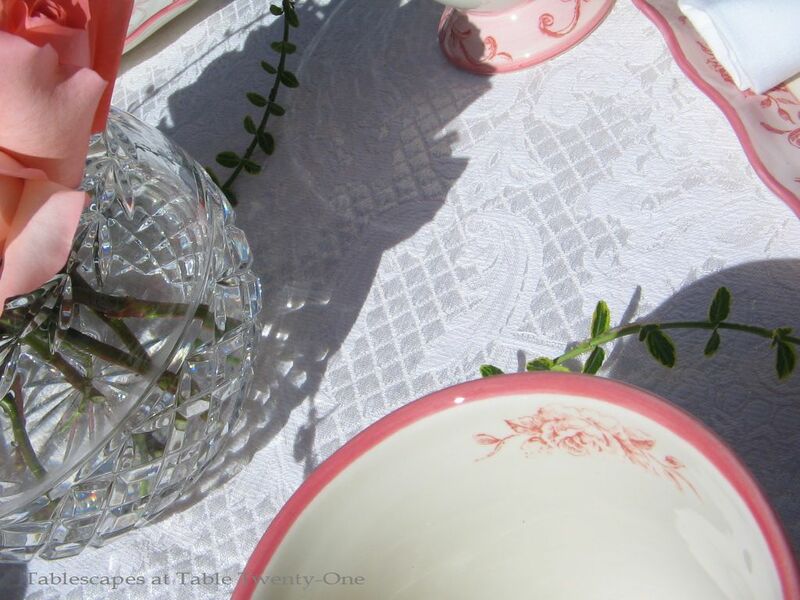 I had to check out the other tea tables and they are all just lovely!! Alycia, I just checked out all the tables under your ‘fun stuff’ tab and oh my! There is not one setting I would not love to have on my table. You are so talented! 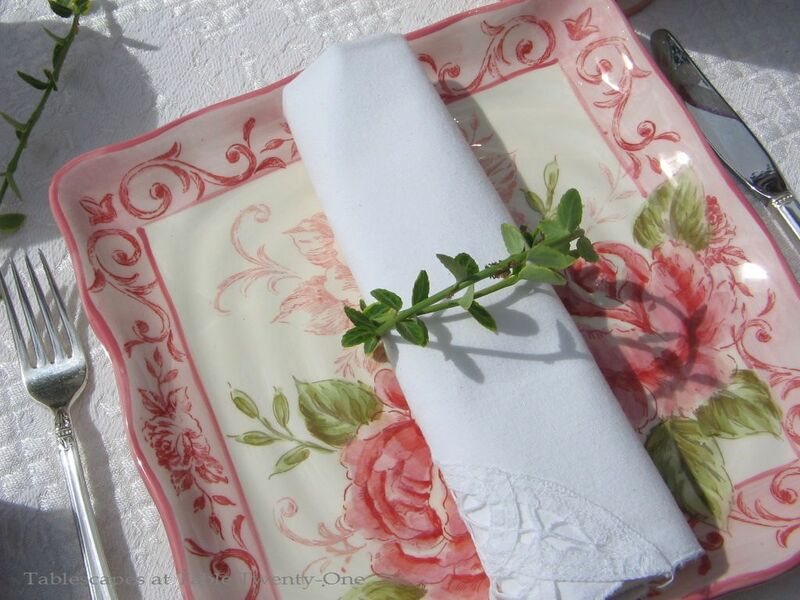 You make me want to run out and get some pink dishes to set such a pretty table. The Paris table setting is breath taking , especially the night pics of the lit candles, truly dramatic. I am checking out your site for the next tea party I host. The ideas for food, settings, etc….well, you’re the place to see.